Kurdistan within Iraq has proven to be a surprising island of stability in the region and the country. Its success has cascading repercussions for Iraq and the wider region and, of course, energy developments. Although Kurdistan is unlikely to realize a significant impact on worldwide oil markets in the short term, the developments there, in both politics and oil, could produce significant changes and difficulties in the Middle East. Kurdistani oil has been described as “the last easy oil” in the world, where one can “put a pipe in the ground and the oil starts flowing” according to the International Energy Agency’s executive director Maria van der Hoeven. Under Saddam Hussein, the region remained a target for oppression and underdevelopment. Hussein’s central government sought to divide and conquer the Kurds politically and settle traditionally Kurdish areas with Sunni Arabs. Upon the Kurdish cooperation with Iran during the Iran-Iraq War, Hussein exacted his vengeance, resulting in the infamous attacks on the Kurds in the late 1980s. Following the Gulf War, Kurdistan remained a victim in the general UN sanctions program against Iraq, although it did receive some revenues from the oil-for-food program. It also maintained a level of autonomy in the 1990s as the West imposed a no fly zone and central government troops withdrew from the region. In terms of oil, Iraq developed the oil fields near Kirkuk, yet they remained under central control despite their proximity to Kurdistan. After the 2003 invasion, Kurdistan was spared much of the chaos and managed to emerge as the most stable part of Iraq. The Kurdistan Regional Government (KRG) has focused on branding itself as different from the rest of the country and seeking foreign investors through economic liberalization and political stability. Proven reserves in the territory under KRG administration figures at about 45 billion barrels. This accounts for about 30% of Iraq’s 150 billion barrels of proven reserves. It’s no surprise that major oil companies are looking to develop oil plays under the suzerainty of the KRG. Exxon, Chevron, and Total and an assortment of smaller E&P firms are trying to operate in the area. According to KRG figures, Kurdistan itself exported 100,000 barrels a day in 2011, constituting about 3.5% of total Iraqi production. According to Ashti Hawrami, the KRG’s Minister of Natural Resources, Kurdistan presently produces 300,000 barrels daily, an increase amounting to 9.6% of total Iraqi production (BP figures). However, oil industry sources put the KRG’s total export capacity at 225,000 bpd. Of these exports, Kurdistan has relied on trucks to transport it about 50,000 bpd into Turkey. 2014 appears to be set to see oil production increase by 33% to 400,000 bpd through the use of newly built pipelines. Hawrami, ever optimistic, predicts 1 million bpd in 2014, though previous KRG projections from 2009 wildly overestimated production figures, expecting 400,000 bpd by 2011 and 1 million bpd by 2014. Naturally, the KRG has a vested interest in being optimistic about its own prospects to attract foreign investment in an unstable region. In terms of the deals themselves, the KRG has taken a markedly liberalized approach to E&P, offering favorable terms to oil firms. For example, DNO, a Norwegian independent, secured a production sharing agreement (PSA) with the KRG, giving it a 40% share of the first 50 million barrels produced from the Tawke oil field. These terms are more favorable than those offered by the central government, no doubt intended to attract much-needed investment and provide a risk discount to foreign firms. As foreign firms move into Kurdistan to build the production and export infrastructure, the central government in Baghdad is seeking to reassert its dominion over the KRG and force it to seek its approval for exporting crude oil. The Shiite Iraqi prime minister, Nouri al-Maliki, faces two restive regions, Kurdistan itself and the mainly Sunni west of the country. The primary goal of his administration, supported in this respect by both the US and Iran, is to prevent the fragmentation of the country. The latent divisions in the country, repressed during the time of Saddam Hussein, have been a persistent issue since the 2003 invasion. 2013 has proven to be the worst year for sectarian violence since 2007, prompting a centralizing push by Maliki. Following the US departure in 2011, Maliki has had a free hand to secure the power of his Shiite coalition. The Washington Post has a great synopsis of the political dealings in Iraq. In a few words, the US failed to broker a political power sharing agreement in 2010 and backed Maliki’s Shiite coalition for the sake of stability. The US and Iraqi administrations also failed to establish a security agreement, contingent on prosecution immunity for US troops, similar to the current dealings with Afghanistan. Thus, following the American departure in 2011, Iraq was denied a cohesive professional American security force and the US lost additional influence in the country. Maliki took advantage of the American departure to begin persecuting his Sunni political rivals, inciting protests and sectarian violence. Since 2011, the neighboring Syrian civil war has displaced large numbers of people and produced hardened and, often, radicalized fighters. Iraq is now feeling the secondary effects of this development. The Al Qaeda affiliate group, Islamic State of Iraq and Syria (ISIS). has begun encroaching on Iraqi sovereignty, coming into the western Al-Anbar province from Syria. The group seized Fallujah in late December 2013, forcing out the agents of the central government. However, it is uncertain if the local Sunni tribes in the province are cooperating with or confronting ISIS, with some receiving support from the Iraqi army and others remaining opposed to both ISIS and the central government. Any support for ISIS has resulted from Sunni feelings of disenfranchisement since the 2010 elections. Maliki fears losing this city, and thus his legitimacy, and has sent the army to surround Fallujah and wrest control from ISIS. As of this publication, the city remains under siege by the army. Within the context of Maliki and the central government’s slipping control, comes the issue of KRG autonomy and oil exports. Understandably, losing either Kurdistan or Fallujah and the Anbar province to ISIS will deal a heavy blow to central legitimacy. Losing just one of these battles for political dominance will strengthen the resolve of political opponents in the other. 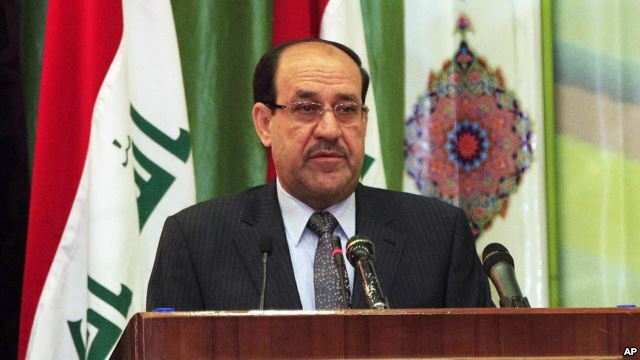 As such, Maliki is put in an unenviable position of fighting a two-front political battle. Moreover, as more time passes and a section of the country remains out of his control, not only does ISIS entrench itself, but his governance appears ineffectual, giving both the KRG and local Sunni tribes in Anbar additional political maneuverability. Maliki is making some overtures to appeal to the Sunnis, preferring to have them drive out Al Qaeda rather than risk a full assault on Fallujah. Meanwhile, he has attempted to clamp down on the KRG over the issue of oil exports. These exports fall within the purview of the central government, independent Kurdish oil exports remain an affront to Baghdad’s supremacy while denying it Kurdish oil revenues. This has resulted in Maliki threatening to reduce the share of the national budget the KRG receives under the guise of balancing the budget. The KRG is supposed to receive 17% of the budget, though, as the previously cited Economist article mentions, it frequently receives about 12%. The central government maintains that the KRG cheats the system by exporting oil independently through its own pipelines to Turkey and retaining the proceeds, thus it does not deserve its allotted budget. More than a budgetary issue, for Maliki, this is one of sovereignty. Allowing the KRG to retain oil export earnings undermines his own legitimacy while bolstering that of the KRG, which simultaneously receives funding to build up its governmental, security, and energy infrastructure. Maliki cannot be heavy handed with his treatment of either issue, especially with elections looming in April. Yet, he must act lest his consolidated power slip away. The ISIS threat is clearly more urgent, though it buys time for the KRG to continue establishing itself. The KRG issue could be addressed by sending federal assets, judiciary, military, and police, to ensure that oil is not exported without central sanction. However, this would pull assets away from fighting ISIS and further alienate the Kurds. Alternatively, the central government could attempt to buy the loyalty of the Kurds and the Sunnis by increasing federal provisions, but that would result in a large budget deficit with the parameters of the present budget. Ultimately, a federal Iraq can only be maintained by amicable relationships between Sunni Arabs, Shiites, and Kurds working towards a single commonwealth. This model can be made to work through the largesse of oil revenues, however, that would require additional stability and a single-minded focus on increasing exports while distributing them where most needed. Political ambitions, pettiness, rivalries, and outside influence all work against this model. Alternatively, it could be preserved through repression as it was during the time of Saddam Hussein. It appears as if Maliki may continue along his path of attempting to retain consolidated Shiite control of the central government through ham-fisted efforts that not only undermine Iraqi federalism and aggravate sectarian tensions, but also reduce the attractiveness of Iraq as a destination for foreign investment into its oil. As Kurdistan builds its institutions, the ambition of independence edges closer to realization. Interestingly enough, the KRG exports oil through Turkey, which has historically persecuted Kurds in its territory. However, energy concerns appear to be more important as Turkey attempts to diversify away from Russian and Iranian energy. Turkey’s prime minister Erdogan recently began reconciliation efforts with the Kurds, as Syrian Kurds have begun carving out their own part of Syria. Perhaps Erdogan is trying to push the Kurds away from the radical Kurdish parties in Turkey and into their own independent state, one that does not remove present Turkish territory. Pushing the Kurds to an independent Syrian or Iraqi Kurdistan may help alleviate the issue of Kurdish actions against the Turkish state, though, alternatively, they could press for pieces of Turkey with a Kurdish majority. Turkey is simultaneously attempting to build relations with Baghdad, which could provide a major source of hydrocarbons for Turkish growth. It appears that in the long-run, it can only accomplish cordial relations with either Kurdistan or Baghdad, given the former’s separatist intentions. Furthermore, it is important to note that many other players in the region have their own restive regions clamoring for independence and a successfully independent Kurdistan would legitimize these ambitions further. Iran, Syria, Israel, Russia, and, of course, Iraq would all prefer the status quo. The second and third order effects in these countries could be far-reaching, potentially resulting in shocks to energy markets and the regional military balance. A fully independent Kurdistan with cordial relations with Turkey, and thus secured export lanes, would not likely shift oil markets very much in the near term. Even if exports rise to 1 million bpd, a potential fracturing of Iraq would result in higher oil prices as markets react to instability and the government loses additional ability to combat ISIS and other separatist factions. This could have multiple consequences for the region as a whole, which is likely why the US continues to support a unified federal Iraq. The future of the country remains in Maliki’s hands, he will either sacrifice its future stability and prosperity on the alter of sectarian politics or begin the reconciliation process to include Sunnis and Kurds in the spoils of Iraq’s oil wealth. He has not been this magnanimous in the past, and it remains likely that violence will increase as the central government loses its grip on different provinces. Though this likely remains positive for the KRG in the near term, the instability in Iraq will prove debilitating to its recent upward trajectory in oil exports.